You’ve been looking at your home and you know it’s time for an uplift, maintenance and a new coat of paint! This is a big task to take on and may bring you a sense of fear, you may choose to hire a painting contractor. However, it can be fun and refreshing as well. Painting your home will bring a feeling of a new home and a sense of pride for you and your community. Here are some facts and ideas to help you simplify when selecting the right color for your home, as well as information on why, the color you pick matters. Yes! When summer comes to your hemisphere, color can greatly reduce the energy consumption in your home. If you think of a hot sunny day and you are wearing a white shirt, you may be cooler, whereas, if you were wearing a black shirt you may be roasting! The scientific fact is that white reflects the radiant energy rays of the sun and black absorbs them. This has the same impact on your home. The hotter the walls and roof, the hotter the rooms behind and below. Lighter colors on your home is like a white shirt for your house because they reflect radiant energy. Light shades and hues of color, such as greys, blues, greens and tans, are better than in their dark variation. Choose a color that brings out the natural beauty, character and architectural characteristics of your home and neighborhood. Landscape: Blend and coordinate with the landscape around your house using a wide variety of colors from an earthy palette of greens and browns to a beach like pallet of vivid blues and turquoises, or even a beautiful desert scape with tans, browns, corrals and reds. Roof: Some colors are already chosen and permanent, such as your roof. Roofing materials come in a variety of colors and should be a large part of your consideration when choosing the exterior colors for your home. It doesn’t need to match the roof, but it should harmonize. 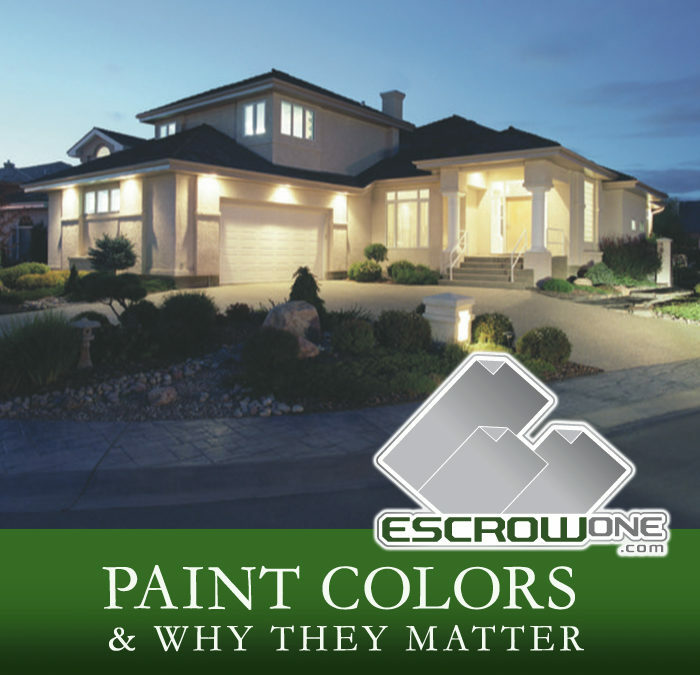 When choosing exterior paint, start with what’s already there. Paint is easier to change than a roof. Stone: Every home has some features such as brick, stone, or concrete that will not be painted. Maybe even a dominant chimney, vinyl windows, railings or a natural wooden door. These are also permanent materials that have their own colors and you should choose a color scheme that harmonizes with these colors already present on your house. Size: Light colors make a building look larger. This is why grandeur estates are often painted white. White is also the favored color for traditional classical architecture, such as The White House! You can add to your home’s sense of size by using white or a pale cream color. Use darker colors to emphasize shadows and lighter colors to show projections. Extreme dark colors will make your home appear smaller in size, possibly affecting curb appeal. Lighting: Consider where the sun shines onto your house as this may affect the shade of color you select. The sun shining directly on your home can make a color look a shade lighter and the same color in the shade will tend to look a shade darker. History: Do you have an older home? If so, you’ll probably want to use a historical color scheme that is accurate for the time your home was built. You can hire a pro to analyze old paint chips and recreate the original color. Or, you can refer to a historic color chart to select historical shades that are pleasing to you. Choose wisely, because what you do and select will become part of that history. Neighborhood: Blend with the houses in your neighborhood, but don’t copy your neighbor exactly. Choose colors that set your house apart, but also blend with nearby homes in your community. Choosing colors that coordinate with what is around you and avoid that crazy stand out color that may upset your neighbors. Contrasting colors will draw attention to architectural details but, extreme contrasts will clash and actually detract. For some accents, try using a darker or lighter shade of the same color instead of an entirely different color. Try for a balance of color. A burst of a single color on just one part of your home may give it a lopsided appearance. Try to achieve a balance over roof, house and landscape. Remember that very bright or very deep colors will fade quicker. The more intense a color, the more likely it is to fade. But, don’t rule out dark colors. They won’t show dust and stains, and can give your house a sense of dignity or drama. Sheens, ranging from glossy to flat are a few to select from. The glossier the surface, the more likely it is to show imperfections, brush strokes, and touch up marks. On the other hand, glossy surfaces are easier to clean. Many homeowners opt to use flat paint for walls and semi-gloss or glossy paint for columns, railings, and windows. Color swatches or computer color charts can look very different when they are brought out of the store and viewed in natural sunlight. Also, colors appear lighter on large surfaces than they do on small samples. Study color samples outdoors, but never in direct sunlight, the sun will distort the color. Before buying large quantities of paint, buy quarts of your selected colors and paint a large swatch on your house to compare and see if it is the color you can live with. Be sure to have fun with this process and take before and after photos to compare and reflect on your progress. You will enjoy seeing your beautiful end result.